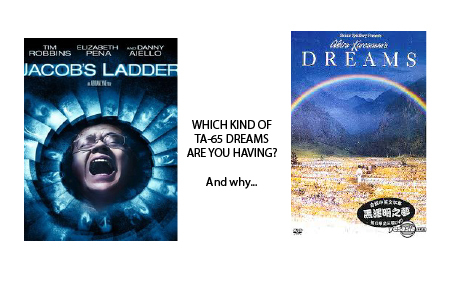 For those of you who take TA-65 or Recharge, you know there are profound changes that occur with sleep. The other day, I received an email from a non-client/non-patient asking for help with sleep disturbances from taking TA-65. Ironically, in the same 24-hr period , I received this email from a patient who had just started Recharge. Unlike the former person, she had been forewarned about the changes in brief awakenings and welcomed them as a sign of efficacy. I took 4 caps of the Recharge last night and I have to say that I felt absolutely amazing this morning! That was the best night of sleep I have had in a VERY, VERY long time! Wow! I am looking forward to another restful night and experiencing the benefits of this product! So how do we reconcile this difference? Let me first explain that unlike medications, which usually act the same on different people because they activate or inhibit specific biochemical pathways, adaptogens like those in TA-65 and Recharge have variable effects. This video attempts to explain adaptogens. 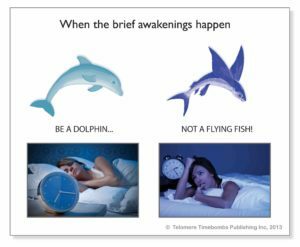 First, we have to understand that the brief awakenings that normally happen every 90 minutes appear to be much more abrupt as a result of very efficient awakening- this “dolphin effect” is jarring to most people who associate being wide awake at 3AM as a kind of complication. Once you are used to it, you can actually ignore it and go back to sleep in seconds. More important is the principle that you can’t run away from yourself. All we experience is a result of the feelings we generate. Emotions, mixed with cognitive schemas, generate feelings and structures which coalesce into anxiety about the future and regret about the past. Because our consciousness (and even our bodies to an extent) store memories, ideas, beliefs, and ghosts, taking an adaptogen results in thawing some of those memories. In a person who is blissful and has worked out much of their ‘baggage’ through meditation, right action, and correct belief, then sleep can be better. If, on the other hand, you are riddled with much anxiety that is unresolved, the subconscious can generate some pretty scary “monsters from the ID” (to borrow the phrase from Forbidden Planet). The interesting thing is that this is usually like an intense dream therapy and it occurs mostly in the first two weeks; if you can tough it out, and it is emotionally exhausting for many, then you often are recast as a hero in your dreams rather than a victim. Because many people active create and then hide from their “shadow side”, the experience of heightened dream efficiency can take the form of nightmares. If you are well integrated and have a stable and gracious relationship with your demons, then sleep will be pleasurable. Adaptogens force your cells and your entire being into the present, where all things are possible; but the angels and demons that we spend so much effort to keep at bay also are more evident when you are in a state of heightened awareness and integrated flow. And so it goes with taking a sleep enhancer working on a holistic level to optimize cellular communication and repair. If you practice gratitude and abundance, you will move to a higher and more peaceful state; if you cling to a fear-based narrative for some reason that you have hidden from yourself, then you may experience problems. Lately, I have become less dogmatic with new patients. I tell them if then have bad dreams or difficulty falling back to sleep, to take adaptogens in the morning for a few days to weeks. Eventually, the body and its consciousness will find a way to steer you towards greater wisdom and flow.